The eggs are easier to see than the lice. Nits (eggs) are tiny white specks attached to hairs. Unlike dandruff or sand, nits can't be shaken off the hair shafts. Itching of the scalp is the main symptom. A scalp rash may be present. The back of the neck is the favorite area. Lice are 1/16-inch (2 mm) long gray-colored bugs. They move quickly and are difficult to see. They are the size of a sesame seed. The lice feed on blood from the scalp. While the bug is sucking blood, some of its secretions get mixed in. Any scalp rash or bumps is the body's reaction to the bug's saliva. The nits (eggs) hatch into lice in about 1 week. 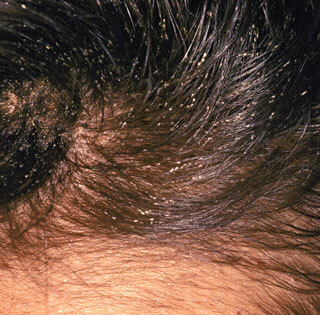 Nits (eggs) that are over ½ inch (1 cm) from the scalp are empty egg cases. They are very white in color. Off the scalp, nits (eggs) can't survive over 2 weeks. 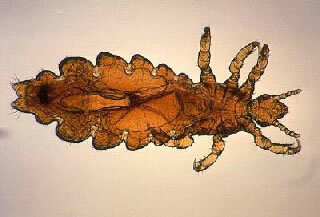 Adult lice survive 3 weeks on the scalp or 24 hours off the scalp. Only live lice can give lice to another child. Nits (lice eggs) cannot pass on lice. 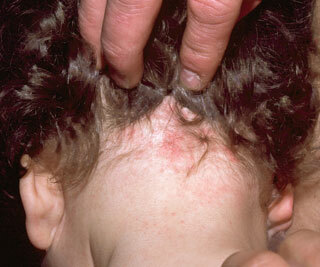 Nits are attached to the child's hair. Almost all spread of lice is from direct hair-to-hair contact. Lice cannot jump or fly to another person's hair. The spread of lice from hats, hair brushes or combs is not common. Headphones and other objects also do not usually spread lice. Most often, the spread of lice to others occurs at home, not school. Sleepovers and bed-sharing are a major source. Head lice can be treated at home. With careful treatment, all lice and nits (lice eggs) are usually killed. There are no lasting problems from having head lice. They do not carry any diseases. They do not make your child feel sick. Buy some anti-lice creme rinse (such as Nix) and follow package directions. No prescription is needed. First, wash the hair with a regular shampoo. Then, towel dry it before using the anti-lice creme. Do not use a conditioner or creme rinse after shampooing. Reason: It will interfere with Nix. Pour 2 ounces (full bottle or 60 mL) of Nix into damp hair. People with long hair may need to use 2 bottles. Work the creme into all the hair down to the roots. If needed, add a little warm water to work up a lather. Nix is safe above 2 months old. Leave the shampoo on for a full 10 minutes. If you don't, it won't kill all the lice. Then rinse the hair well with water and dry it with a towel. Repeat the anti-lice shampoo in 9 days. Be sure to do this or the lice may come back. Two treatments are always needed. The second treatment will kill any new lice that have hatched from eggs. Nit removal is not necessary. It should not interfere with the return to school. Some schools, however, have a no-nit policy. They will not allow children to return if nits are seen. The American Academy of Pediatrics advise that no-nit policies be no longer used. The National Association of School Nurses also takes this stand. If your child's school has a no-nit policy, call your child's doctor. Reasoning: Only live lice can spread lice to another child. One treatment with Nix kills all the lice. Nits (lice eggs) do not spread lice. Most treated nits (lice eggs) are dead after the first treatment with Nix. The others will be killed with the 2nd treatment. Removing the dead nits is not essential or urgent. However, it prevents others from thinking your child still has untreated lice. Nits can be removed by backcombing with a special nit comb. You can also pull them out one at a time. This will take a lot of time. Don't wash the hair with shampoo until 2 days after Nix treatment. Avoid hair conditioners before treatment. Do not use them for 2 weeks after treatment. Reason: Coats the hair and interferes with Nix. Check the heads of everyone else living in your home. If lice or nits are seen, they also should be treated. Use the anti-lice shampoo on them as well. Also, anyone with an itchy scalp rash should be treated. Bedmates of children with lice should also be treated. If in doubt, have your child checked for lice. Lice are spread by close contact. They cannot jump or fly. Your child can return to school after 1 treatment with the anti-lice shampoo. do they cause lice in others. Remind your child not to share combs and hats. Be sure to tell the school nurse or child care center director. She can check other students in your child's class. Avoid close contact with others until after the first anti-lice treatment. Lice that are off the body rarely cause infection. Reason: Lice can't live for over 24 hours off the human body. Vacuum your child's room. Soak hair brushes for 1 hour in a solution containing some anti-lice shampoo. Wash your child's sheets, blankets, and pillow cases. Wash any clothes worn in the past 2 days. Wash in hot water (130° F or 54° C). This kills lice and nits. With 2 treatments, all lice and nits should be killed. If lice come back, it can mean another contact with an infected person. It can also be that the shampoo wasn't left on for 10 minutes. It may also mean that hair conditioner was used. Also, make sure the Nix is repeated in 9 days. If you don't, the lice may come back. Go to your drugstore and buy Cetaphil cleanser in the soap department. No prescription is needed. It works by coating the lice and suffocating them. Apply the Cetaphil cleanser throughout the scalp to dry hair. After all the hair is wet, wait 2 minutes for Cetaphil to soak in. Comb out as much excess cleanser as possible. Blow dry your child's hair. It has to be thoroughly dry down to the scalp to suffocate the lice. Expect this to take 3 times longer than normal drying. The dried Cetaphil will smother the lice. Leave it on your child's hair for at least 8 hours. In the morning, wash off the Cetaphil with a regular shampoo. To cure your child of lice, repeat this process twice in 1 and 2 weeks. The cure rate can be 97%. Detailed instructions can be found online: Nuvo Method for Head Lice. 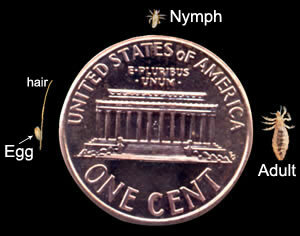 Head Lice Size Compared to a Penny Egg (Nit): Nits are head lice eggs. They are very small, about the size of a knot in thread. They are hard to see and are often look like dandruff or hair spray droplets. Nits are laid by the female louse at the base of the hair shaft, near the scalp. They are firmly attached to the hair shaft. They are oval and usually yellow to white. Nits take about 1 week to hatch. Eggs that are likely to hatch are usually located within ¼ inch of the scalp. Nymph: the nit hatches into a baby louse called a nymph. It looks like an adult louse, but smaller. Nymphs mature into adults about 7 days after hatching. To live, the nymph must feed on blood. Adult: the adult louse is about the size of a sesame seed, has six legs and is tan to greyish-white. In people with dark hair, the adult louse will look darker. Female lice, which are usually larger than male lice, lay eggs. Adult lice can live up to 30 days on a person's head. To live, adult lice need to feed on blood. If the louse falls off a person, it dies within 2 days. This shows head lice nits in the hair. Nits are the eggs of head lice which stick to the hair. This shows an allergic reaction to the saliva of a louse (a louse is one lice). It makes the skin itchy and red.